This is a picture of Sarah. Who was Sarah Breedlove walker? Sarah was born on December 23, 1867. grew up on a cotton farm in Delta, Louisiana. She had four brothers and one sister. They were slaves but they were set free, but her wonderful life took a turn in the early 1970’s her mom died, two years later her dad died she couldn’t live with her brothers because they were looking for jobs. So she went to her sister’s Sarah was 17 yrs old. Soon Sarah married Charles E. Walker. Sarah became Madam C.J. Walker they had a daughter named Letia. Her hair was falling out, so she decided to get a scalp treatment. she liked it so much she started her own business called Madam’s hair growing masterpiece. Soon she was know as a self- made female millionaire. She was the first african american woman to become a wealthy business owner. 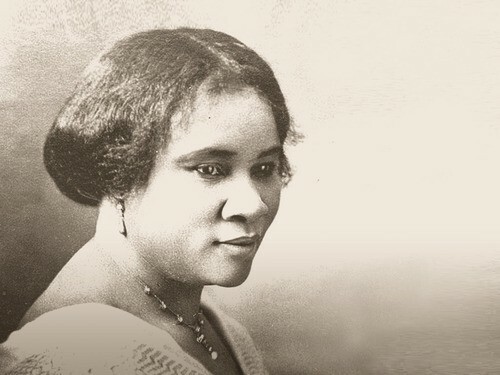 She also operated a successful cosmetics company, the Madam C.J walker manufacturing c.o. During the early 1900’s, she trained women to know their own businesses so they could sell hair products too. if they wanted to. She started the Walker agents they wore white blouses and long black skirts. She also worked as a washerwoman. She died on may 1919 and lead her business on to her daughter. SHOULD WE TRY TO BE MORE LIKE THEM?? Yes, she helped a lot of people and she believed she could do anything. Even though people mistreated her she was kind. She worked hard for what she wanted and it happened. She had confidence in herself. She knew she could help people even if it took her life.